There are two border crossings between Ecuador and Colombia. The main one is on the Pan American Highway. 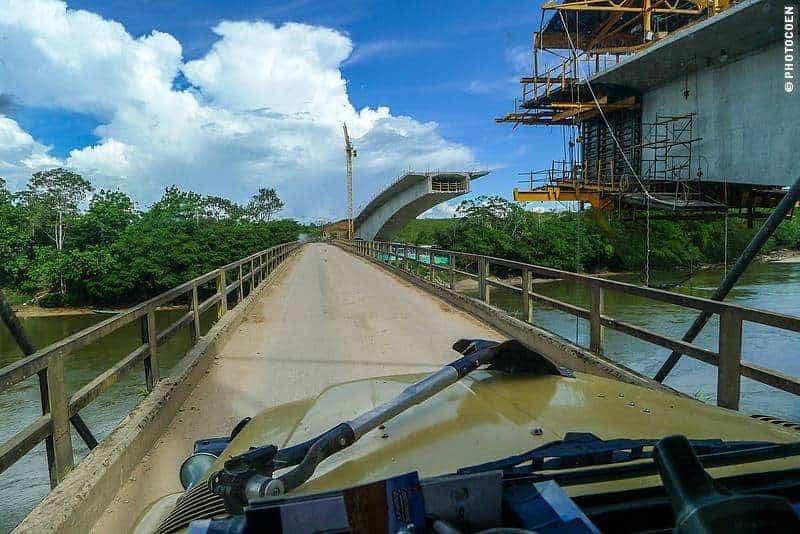 The second lies to the east, in the Amazon: the border crossing of San Miguel. 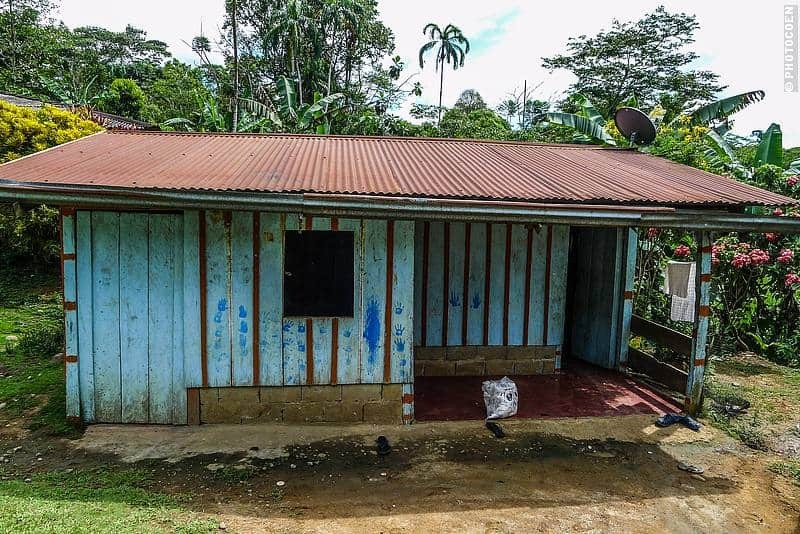 It is little used as the region north of this border, the state of Putumayo, has since long been a FARC stronghold. 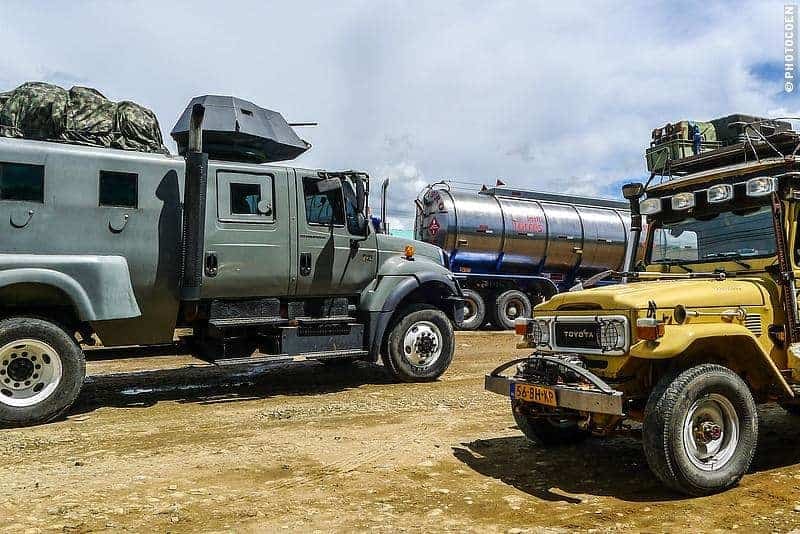 Is It Safe to Drive From Lago Agrio to Mocoa? We were in the Ecuadorian Amazon and preferred taking the San Miguel border. It would spare us many kilometers of backtracking to the Andes. 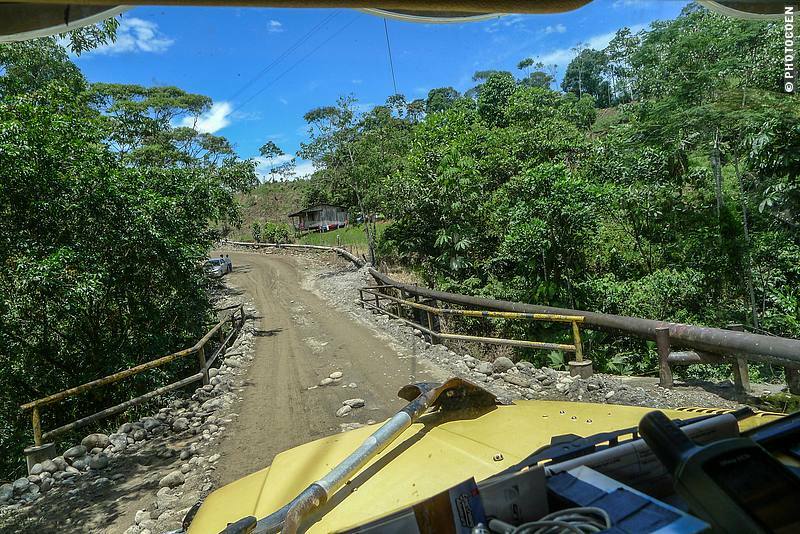 We asked around in Coca, where people said it was now safe to drive from Lago Agrio (Ecuador) to Mocoa (Colombia). In Lago Agrio we stayed with Colombians who originate from Putumayo. Our host pointed out on a map which road we should follow and which one we should avoid. 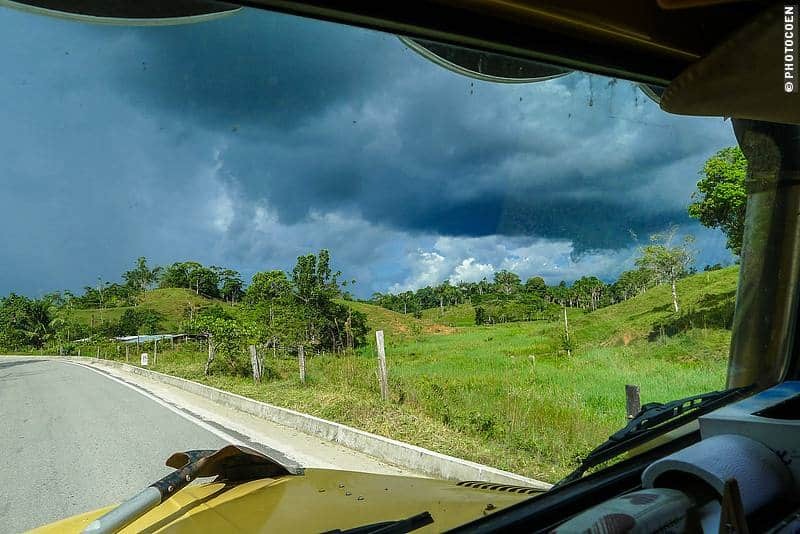 We were lucky as our fellow overlanders of the Trans-Americas Journey were in Mocoa. They asked for information over there and emailed us that according to their source the road was safe to drive. Last but not least, the Lonely Planet says the border is being used more often (with the remark that you should always check the situation on the spot!). Lonely Planet is the first to warn you against everything so when they don’t give an absolute ‘no’, well, that’s quite something. (Please, don’t tell me the Lonely Planet is unreliable; there may be mistakes or differences of opinion, but it is the best-selling travel guidebook for a reason). With this information we felt safe to take this road. 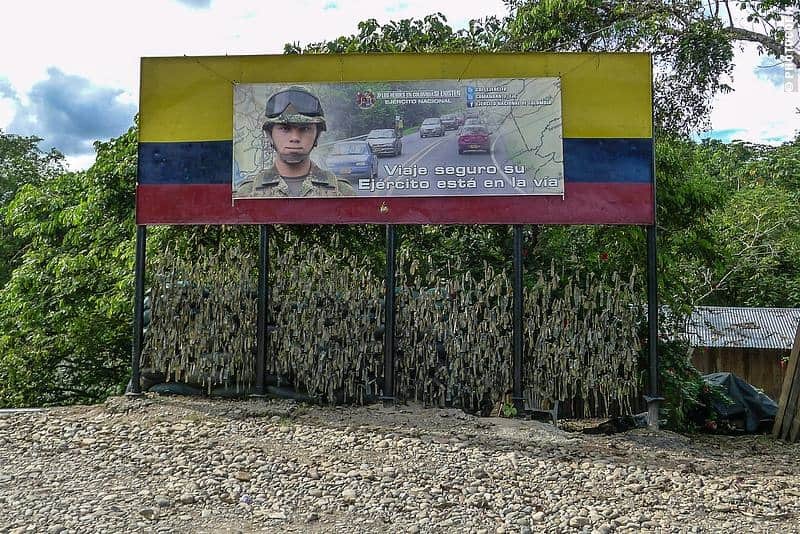 The border crossing lies north of Lago Agrio, about a twenty-minute drive. The immigration and customs of the Ecuadorian, as well as the Colombian side, are conveniently situated in one big, blue-painted building on the Ecuadorian side of the San Miguel River. The paperwork was easy-going and done within half an hour. The river is the actual border crossing and after having crossed the bridge we could immediately see and feel we were in a different country. 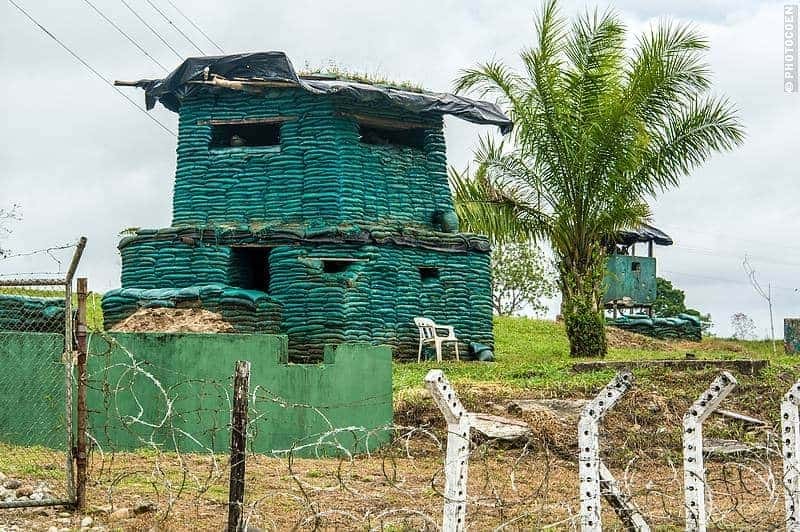 On the Colombian side stood soldiers and bunkers made of green sandbags. The soldiers stopped us and local men and taxi drivers surrounded us (flashback feeling of India, by the way). The soldiers checked our passports and we ended up chatting about our journey. It was an easy drive. Up to Santa Ana the road was unpaved. Afterwards, it was asphalt but it had potholes. People live in wooden huts painted in soft tinges, which colors the otherwise incredibly green surroundings. All around us were forest-covered mountain slopes alternating with patches of open terrain, cleared for a house, cultivation of crops, or for cattle. This area, specifically around Orito, is where most of Colombia’s oil is drilled. We passed several oil rigs. 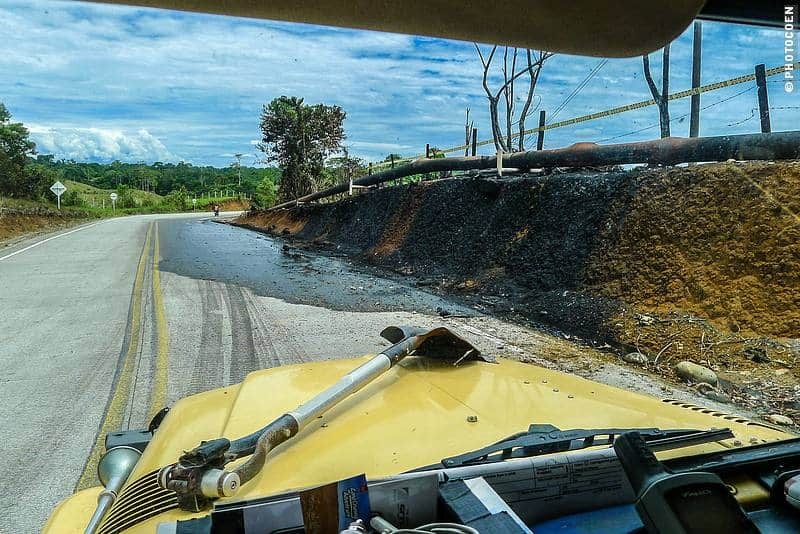 All along the road are oil pipelines, and that’s where the FARC comes in. They like to blow those up. Which had happened the evening prior to our driving here and for a short while the road was closed because of some clean-up activity. This part is ugly: lots of oil spills. Our Colombian friend in Lago Agrio had warned us for this. 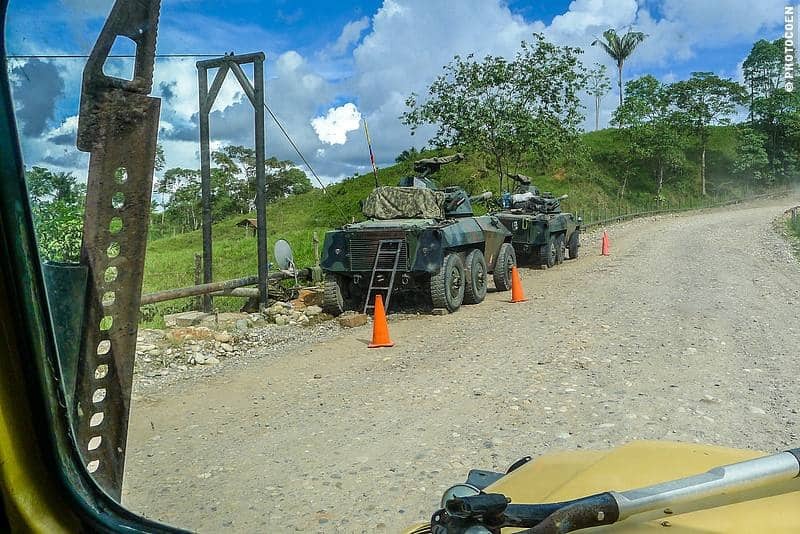 The FARC (at least here and now) is not (physically) harming citizens or tourists. They wait for an area to be void of people and only then blow up oil pipes. The owner of La Casa del Rio Hostel in Mocoa later confirmed this story. Parts of the road are black but, worse, some of the countryside is polluted as well. We passed a couple of beautiful areas covered with a layer of black filth. At two places a group of people in white protective gear were cleaning up the mess. One of them said they have been working here for months. There are quite a few checkpoints but we never had to stop. We passed a lot sandbag bunkers e.g. in front of police stations. 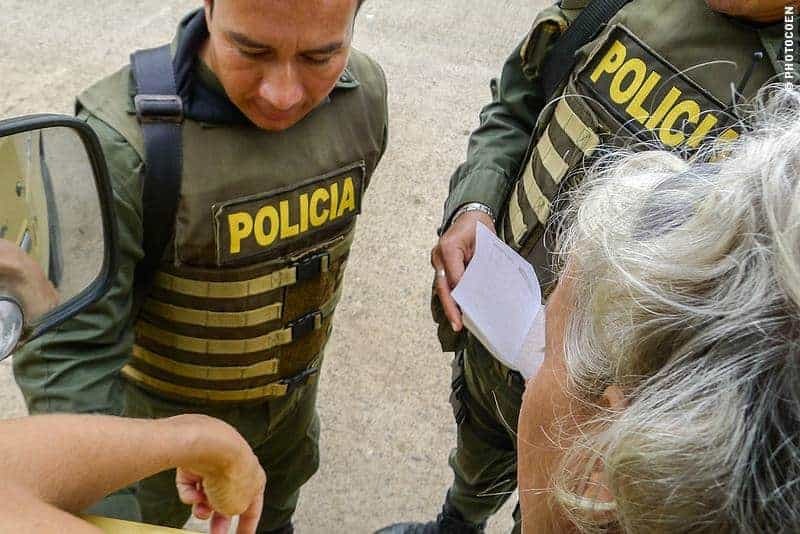 Police officers, militaries and government officials are human targets of the FARC, we learned. During our 11-year journey we have never driven through an area with so many tanks except maybe in Thailand right after a coup. We stopped for lunch at a roadside restaurant and parked the Land Cruiser right in front of it. Minutes later arrived five huge petrol trucks arrived and blocked the Land Cruiser. They were escorted by two tanks. We ate our soup and rice with fried fish in the company of their drivers. Locals had told us that the trip from Lago Agrio to Mocoa should take about four hours. It took us six because in mountains the Land Cruiser is as slow as a snail. We can’t say it was a particularly pleasurable ride. The surroundings are too telling about the reality many Colombians still have to live with and that’s not a pretty one. Having said that, we felt safe, and wouldn’t mind driving the stretch again. Is it safe for you to drive? We don’t know. Things change, sometimes very rapidly. 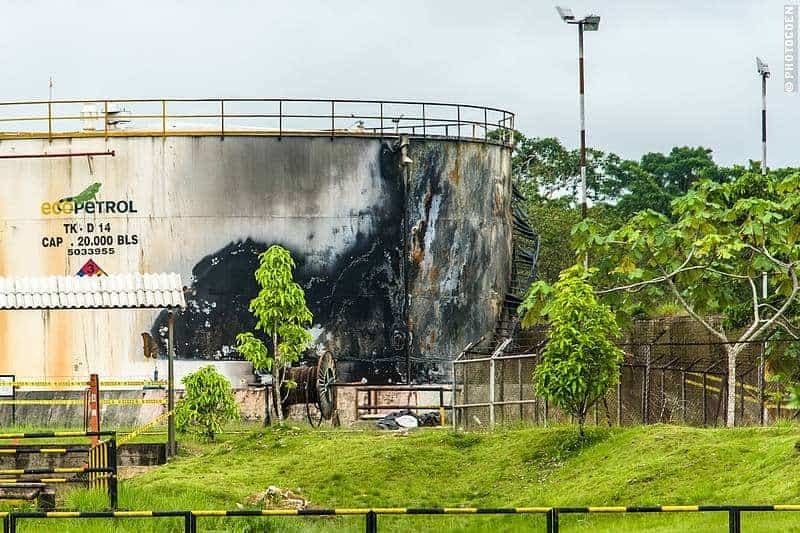 If you go – but that goes pretty much about every place, especially in Colombia – ask around, get the latest information and only go if you have that gut feeling you’ll be okay. If in doubt, stick to the Pan American Highway. 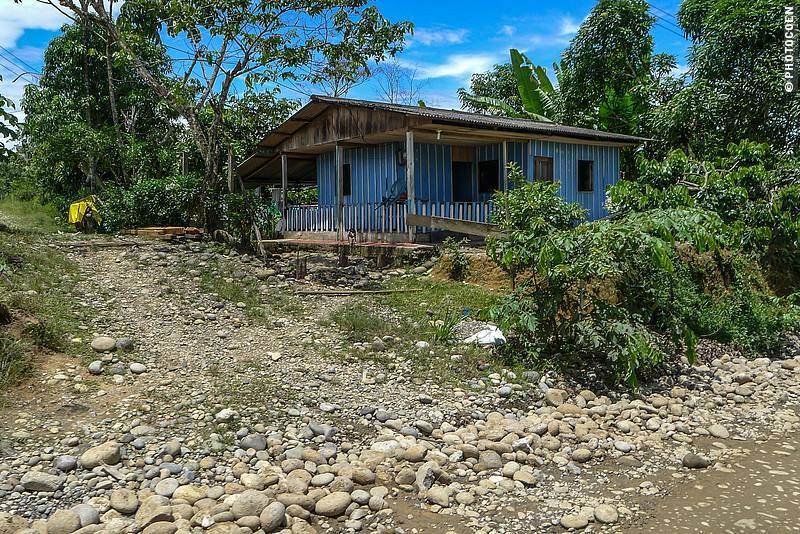 In case you’re driving from Colombia to Ecuador, you could check with the Belgian owner Philip of Casa del Rio Hostel just outside Mocoa on the latest info. We camped in the garden for a week (nice place!) and found his information on Colombia very helpful. Can you read investing in infrastructure as hope for the future? i love to see my country trough foreign eyes!